Abstract: This paper aims at vise reexamining the study of secularism in social sciences and humanities, which is all but simple to cope with. 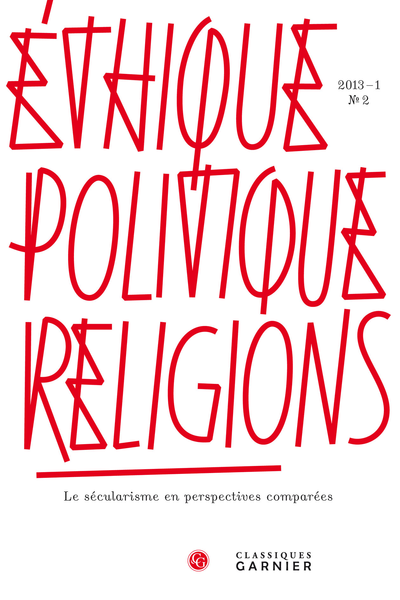 Secularism is a singular concept not reducible to other close terms like atheism or laïcité. It is associated with a political project and follows the course of a broader process, i.e., secularization. This is why secularism is conferred a distinctive feature in the semantic field and among the different terms relating to secular facts and issues. This paper traces back some of the most significant theoretical developments regarding the study of secularism. It attempts to map the major and most recent lines of the reflection in academic milieu, to point at the intellectual dead ends, and above all to attempt to draw the outlines of a multidisciplinary frame, otherwise expressed in rather different terminologies depending on the context (North-American, European, other). Still, secularism remains a concept located at the crossroads of disciplinary fields.